How Does Angel Kim Beom Fly? In Padam Padam… The Sound of His and Her Heartbeats, Kim Beom who plays the role of Lee Gook Soo gradually grows a pair of wings on his back, and transforms into an angel. With the wings, angel Kim Bum eventually flies to the sky, revealing his true identity. 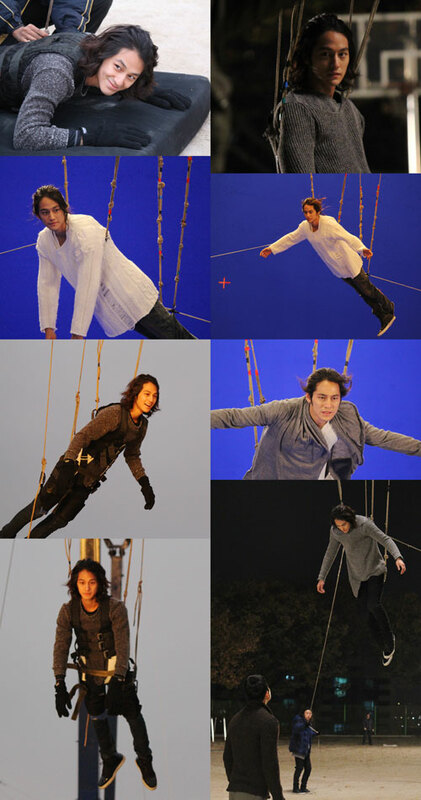 The producer of Padam Padam has released several behind the scene photos which show the making of scenes when Kim Beom is flying as angel, as shown below. The photos shown that Kim Bum was suspended on wires, which was then removed in post-processing so that the Kim Bum looks flying on screen. In addition, the scene was reportedly shot against green screen to aid the CGI (computer-generated imagery) processing later to digitally add the winds. Netizens who saw the photo commented, “Kim Bum was not scared of hanging on the wire,” “Finally wings are for real,” “Flying with the wings looks so cool,” and so on.